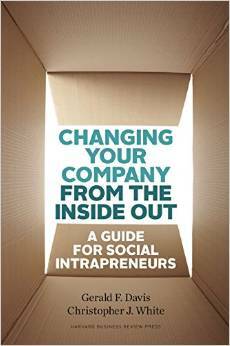 Changing Your Company from the Inside Out offers you the tools you need to champion initiatives that are meaningful to you, socially responsible, and align with your company’s mission and strategy. Drawing on the lessons of dynamic social movements—from the Civil Rights Movement to the Arab Spring—and the real-world successes of corporate intrapreneurs, Davis and White present concrete strategies and tactics for effecting meaningful change in companies. This is an indispensable and practical guide for anyone seeking to create a sustainable venture within an existing enterprise.